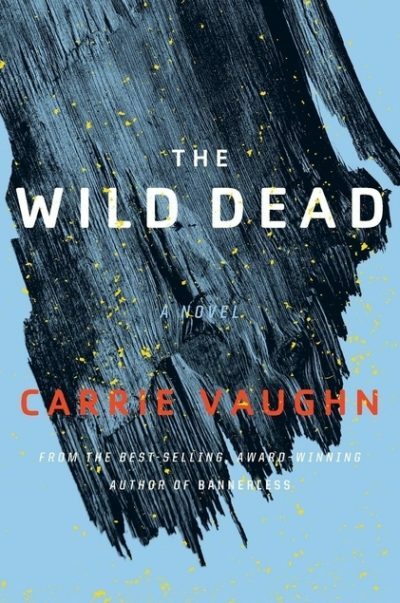 2018’s The Wild Dead is the second volume in Carrie Vaughn’s Bannerless Saga. The Estuary isn’t even a formal town; it’s more of a collection of households that happen to be in close proximity. With no council to settle disputes, the townsfolk request a pair of Investigators, hoping that they can to resolve an ongoing conflict between the Semperfi household and its neighbours. Investigators Enid and Teeg arrive in the Estuary expecting to resolve a straightforward argument over resource allocation. They soon find themselves dealing with murder. The conflict dividing the community started with Semperfi’s dilapidated house. Erik of Semperfi is determined to restore the building; he believes that this will fulfill a promise he made to Semperfi’s long-dead founder. Every other household in Estuary sees that the building is too run down, its foundations too undermined by erosion, to be saved. If this were the only issue, Enid and Teeg could handle it in a few days. Building condemned, case closed. But soon after they arrive, they hear of a dead woman found nearby. It only takes a cursory examination to reveal that the woman died a violent death. The wound that killed her could have been due to accident, but everyone in Estuary believes that her death was deliberate. The investigators are already there and murder falls within their remit. The world post-Fall is thinly populated. The Estuary is an isolated hamlet, far from well-traveled roads. Which makes it odd that the dead woman is not local; indeed, she doesn’t seem to be known anywhere in the Coast Road network of communities. She’s a complete outsider. Nothing for it but to start talking to the inhabitants of the Estuary, looking for explanations and unearthing suspicious inconsistencies in their stories. The dead woman soon has a name — Ella — and a connection to the Estuary: she and her people are wild folk who sometimes trade with Last House, one of the households in the Estuary. Who Ellen was and how she was killed are now clear. Why she was killed, and by whom, are not. Determined detective work will be necessary. Teeg is quick to fix on a culprit; the experienced Enid is wary of premature conclusions. She wants the complete truth. The book features a map. Hmmm. It’s odd that the people of the Coast Road seem to avoid the actual Pacific coast. The only exception is the Estuary. Are there no fishers in this world? Presumably with humans nearly extinct, fish stocks should be rebounding. Well, unless the Fall was a mass extinction event. Or if the Wild Ones have taken the coast for their own. And they don’t seem that organized. The world of Bannerless is generally a pleasant one, even though it’s a post-apocalyptic setting. All of the unpleasantness of the Fall is long in the past (though folks still regret the med-tech of yore, which cured people who cannot be cured now). The people of the Coast Road community are poor, but they seem to be creating a stable society that protects the environment and supports all citizens, not just a wealthy few. Even the wild folk are harmless bands of foragers and scavengers. They are more focused on daily survival than on forming a wandering army of ravenous cannibals out to complete the destruction of human civilization.. The formal apparatus of government and law enforcement relies more on investigator smarts and decency than on regulations and guidelines. Investigators have considerable leeway on how to punish transgressions; they can exile transgressors or deny entire households the right to have sanctioned children. If they are incompetent or corrupt, the system will fail. Investigators in many mysteries set in isolated hamlets and country estates muddle along while the killer knocks off one victim after another. Soon one can finger the murderer by a simple process of elimination. As Miss Marple might have said “Once one has permitted the killer to eliminate all the intended victims, eye witnesses, and hapless bystanders, whoever remains alive, however improbable, must be the murderer1.” Enid, to her credit. relies on hard work and deduction. The body count in this novel is limited. The Wild Dead is available here (Amazon) and here (Chapters-Indigo). 1: Ideally, the detective should survive as well. I cannot think of any mysteries in which the murder of the detective provides the final clue, but there must be some. From the map it's pretty clear that the Coast Road of the story is what is today the 101 freeway from the Bay down to LA. Much of the story seems to be set in the section between Salinas and San Luis Opisbo, in the fertile valley that runs between two ranges of coastal mountains (Fintown appears to be somewhere in the region of Pismo Beach, Pasadan is probably near Paso Robles). The coastal range here runs straight to the sea, and the Big Sur road right on the coast is a triumph of engineering over landslides. It makes sense that the coast from Monterey down to Morro has been abandoned; the roads there will have been made impassible very quickly.